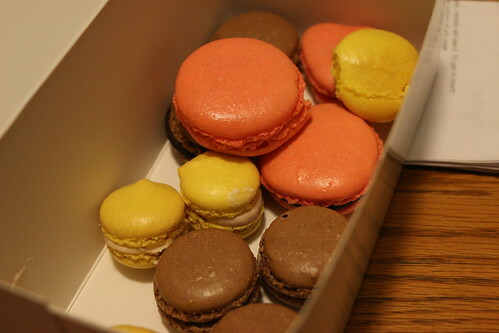 My brother and his girlfriend went to macaron baking classes at Le Dolci. I thought I would do a little post although I didn’t go to experience it first hand. They brought home different sized macaron as there were other students that had participated in making the batter (therefore different consistencies). There were three flavours of shell: chocolate and lemon (and food colouring for the pink shells) and three filling flavours: chocolate, vanilla and strawberry. 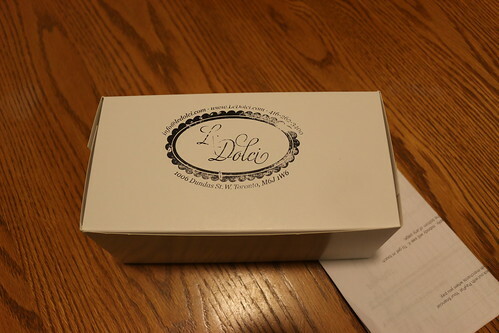 Q: How did you hear about Le Dolci and baking classes? A: The founder of Charming Desserts used to work there, I think. Charming Desserts is a local cake/ bake shop located in the GTA (Greater Toronto Area). I googled ‘macaron classes’ and Le Docli was the first hit. Prices and classes weren’t frequent (according to the calendar) and I decided to buy the lessons. I did not read reviews about the classes before purchasing the classes. Q: Would you go Le Dolci classes again? A: I would because I heard that their cupcake classes were the best…the best cupcakes people ever had. Q: Did you think that the instructors had the appropriate skills needed for the class? A: They were very knowledgable, clear and helpful. But I did not get a chance to take side notes. 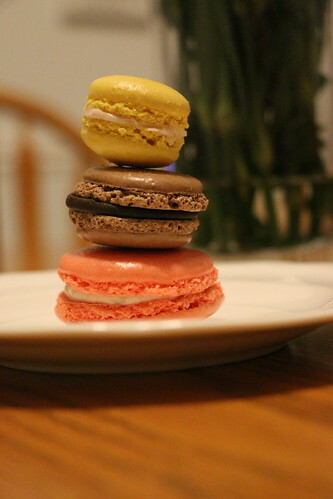 It was too fast paced for me and for anyone who hasn’t tried to make macarons before. The class was lacking equipment; there were eight members per group sharing equipment (stand mixer, 1 baking sheet, hot plate). *This is my first Q&A. I know I have a lot to work on (for the most part), so please excuse me when reading this section.